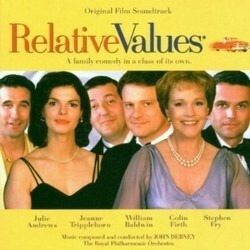 It is hard to believe that a film like Relative Values was made in 2000, it seems so resolutely old fashioned in content and style, even the title has something faintly quaint about it. Listening to John Debney's score the same impression is not dispelled; much of his music manages to sound like the film had been made in 1954 rather than merely set in 1954. There is nothing wrong with that at all, in fact it's quite commendable that he has such a good feeling for period. The main theme is a kind of swing tune that ticks along quite nicely, occasionally complemented by an ooh-aah female backing group. It is perhaps more bracing in style than one might expect from a comedy of manners and social standing. Miranda's Theme is no less jaunty and bounces along perkily. There are of course some quieter moments which are generally pleasant but do rather get lost next to the fast paced material. This is most notable during tracks such as Manor Preparations where quieter woodwind and strings moments occasionally give way to exuberent bursts of the main theme and are completely lost in the memory. However, almost every one of Debney's tracks contains something to delight, one of my favourites being the quite wonderful Romance in 7/8, although it was almost as irritating as it was fun simply because I was trying to count the 7 beats, but kept getting lost. Probably a sign that it is in 7/8 and not a more obvious time signature. I have rarely had cause to complain about Silva Screen's album presentations, but in this case I find their decision to include dialogue snippets regretful. The best thing that can be said for them is that they don't trample over the music at any point and can easily be programmed out. Sadly Relative Values is not filled with hilarious Woody Allen snippets of 30 second neurosis or similar and lines that are possibly funny in context are meaningless and a fraction annoying on disc - 'there are girl guides in the shrubbery dear' - pant wetting stuff. The other non-Debney inclusion is Almost Like Being in Love performed by Rick Riso, whoever he might be. The performance and arrangement are actually quite splendid and work well alongside Debney's music and with the instrumental rounding out the disc, brings things to a close. Not a classic score by any means, but certainly lots of fun, which is something that Debney is good at despite apparently being a rather unassuming chap in real life. Composers rarely seem to radiate joy from their music, but Debney seems to have enjoyed writing Relative Values and this shows during every minute of the perfectly timed album.